This month’s feature is Weddings. I recently started a new set of wedding graphics. 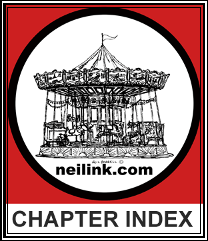 Since these have been consuming a great deal of effort I think they deserve a chapter. 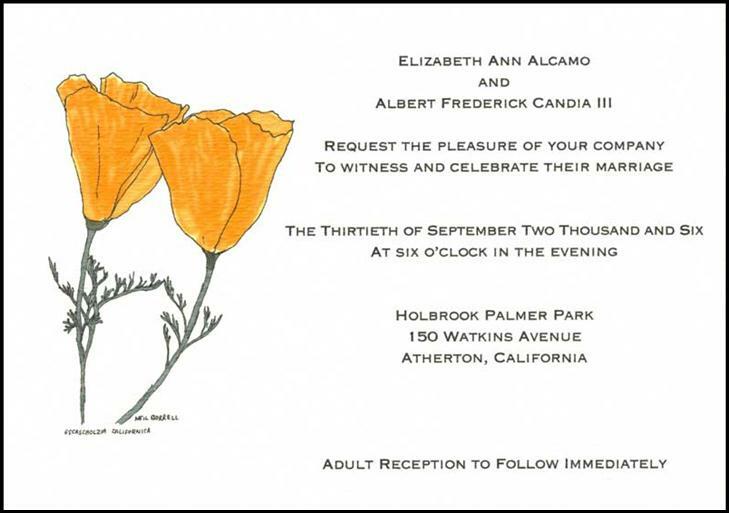 The drawing is of two California Poppies which are a favorite of my niece, Elizabeth and her husband Al. This was my first venture into color in a long time. When I’ve tried color in the past I’ve felt like I spent so much effort into getting the colors exactly right that I’ve lost track of the drawing. I did this one by getting as many pictures of this flower as possible and then cutting and pasting and moving them on the computer until I liked them. I then did a pen and ink drawing by looking at the computer screen. I used to feel like I was in a tunnel when I tried this from photographs but this method seemed better. I then scanned the drawing and did the coloring on the computer. When I’ve tried coloring on the computer in the past I’ve been unhappy with the lack of brushstrokes but I like the way these turned out. Click here to see the photo. I was also one of two officiants at this wedding. After Al’s aunt Trudy and I swore to uphold the Constitution of the State of California we became Deputy Commissioners of Marriage for one day. We legally could have married anyone in the State of California on that day. I tried to drum up some business but got no other takers. Click here to see the entire package for this wedding. 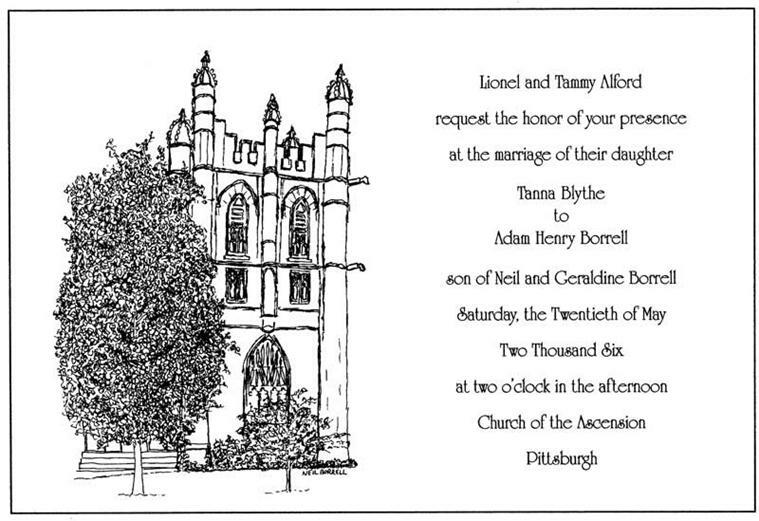 While they were undergraduates at Carnegie Mellon, Adam and Tanna had apartments across the street from the church that their wedding would be held in. I asked Adam to take photos of the church and I put three of them together. There was a pole in the foreground that had to be removed. I drew this one off the computer screen as well. I now have a feed from the computer to a large screen television and I can sit across the room and get a more natural feel. Click here to see the photo. The exterior walls of this church are very dark because of layers of smoke from the steel mill days in Pittsburgh. Click here to see the entire package for this wedding.